During the 2013-2014 academic year, I was awarded a Fulbright U.S. Student grant to Ethiopia to study the coffee supply chain. Growing up in two different cities with strong coffee cultures inspired my appreciation for coffee from a young age. As a child in Addis Ababa, I experienced the rich communal process of the Ethiopian coffee tradition. Later, when my family and I moved to Seattle, I observed the meticulous and creative craft of preparing and marketing specialty coffee. This inspired my desire to develop a better understanding of how my favorite drink travels from farm to cup. 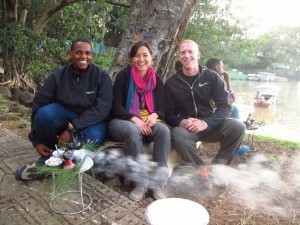 As a Fulbright Student in Ethiopia, I studied the country’s coffee supply chain. From my base in the capital, I made trips throughout Ethiopia’s coffee-growing regions to develop my understanding of the industry by surveying farmers, processors, cooperatives, traders and exporters. Through these surveys, I outlined the industry’s demand forecast and communication methods and identified opportunities for improvement. I performed these surveys with the help of the Ethiopia Commodity Exchange (ECX)—a recently established marketplace that has revolutionized Ethiopian agricultural commodity markets by providing farmers with price transparency and other market information. My project provided the ECX with better visibility of the coffee supply chain. My Fulbright grant in Ethiopia allowed me to witness the complexities of growing, picking, processing, grading and exporting coffee—a precarious marketplace with significant risks that few of its global consumers appreciate. I also had the pleasure of visiting Ethiopia’s coffee-growing regions, which offer some of the most scenic landscapes in the country. My favorite destination was Yirgacheffe, a high-altitude region with rolling hills, morning fog and lush green forests. Aside from my work with the ECX, I also built a community in Addis Ababa through the office soccer team, my neighborhood tennis club and by introducing my friends from Seattle to Ethiopia by hosting their visits and sharing my experiences on my blog. I enjoyed the camaraderie of the ECX office culture and made many good friends through shared experiences at conferences, on the soccer pitch and during work and personal trips.